Chopper 7-HD was over the scene of the accident Friday afternoon near Sutton Road and Magnolia Lane. 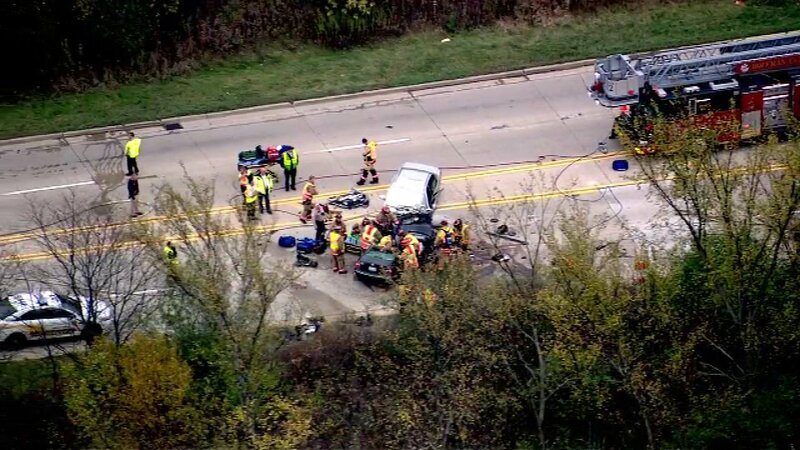 HOFFMAN ESTATES, Ill. (WLS) -- Two men were injured, one seriously, in a head-on crash Friday afternoon in northwest suburban Hoffman Estates. A 21-year-old driver in a Chevrolet was traveling northbound on Route 59 when he veered into the southbound lane and struck a Volkwagen head-on. That driver was taken to a local hospital, but his injuries are not life-threatening. The 25-year-old driver of the Volkswagen was taken to the hospital with life-threatening injuries. Chopper 7-HD was over the scene of the accident at around 3:30 p.m. near Sutton Road and Magnolia Lane. Hoffman Estates police said Route 59 from Shoe Factory Road to Golf Road is closed while officers investigate the accident. The accident is under investigation, a Cook County Sheriff's Office official said.